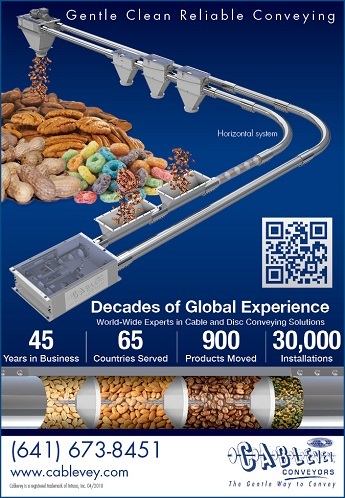 Cablevey Conveyors is a manufacturing company that develops and builds state-of-the-art mechanical systems used to convey delicate materials through tube technology that’s food-safe, highly-efficient, clean, fast and cost-effective. Moving materials through an enclosed tube, using discs pulled with cable, without the use of air make it an efficient operation for materials in food processing, chemical, plastic, paper, wood, waste-water, and petrochemical industries. 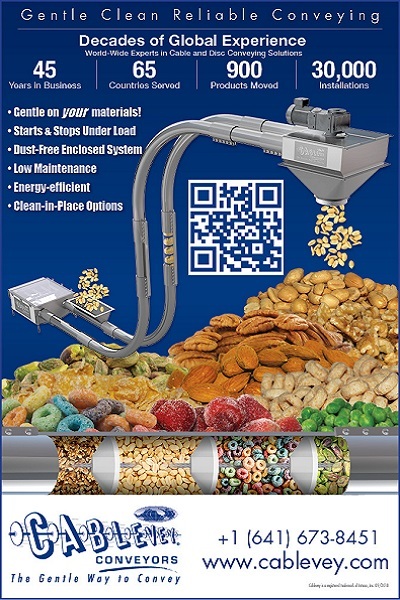 Snack foods, nuts, coffee, flakes, cereal, powders, pellets, shaving, crumbles, granules, fluff and dust can all be handled with ease. Numerous layouts are available using multiple inlets and discharge points that are customized to your specifications. All systems utilize cable and disc technologies and operate at convey speeds which average 100 feet (30.48 meter) per minute. Cablevey offers a 2, 4 and 6 inch system depending on the specifications for your desired material. 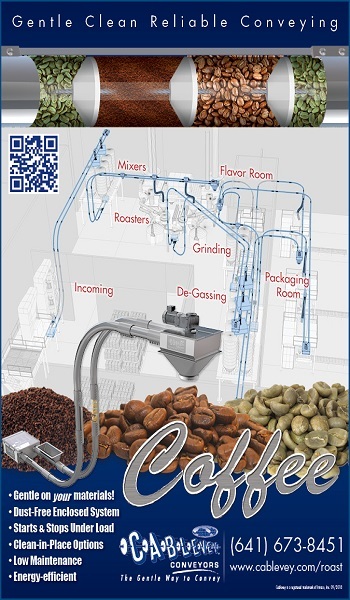 Both wet and dry conveyor cleaning options are available.